So sweet Laura!! Congratulations on your sale! Wonderful color palette! 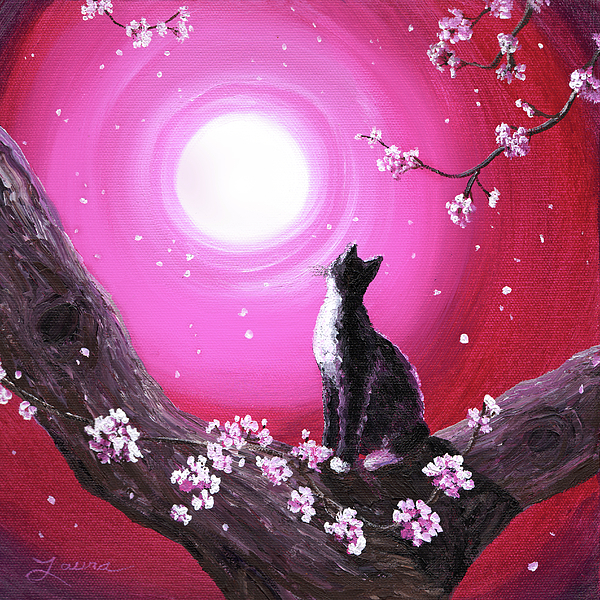 Wow, just discovered your art here Laura! 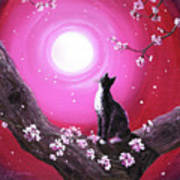 I love cats, I love the moon, I love trees, I love magical dreamy artworks. 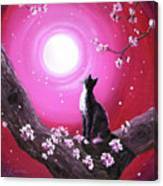 So this is a wonderful painting which I love VERY VERY much! How kind of you to say, Andrea. 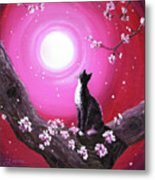 Thank you for visiting my art. Love this artist, these are incredible. I like this, it's sweet & unique! Thank you, Mike :-). I like that pose a lot. I've been thinking of using it with another cat. 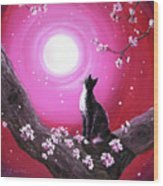 A black and white tuxedo cat sits in a tree watching the cherry blossoms dance in the light of a luminous full moon. This feng shui square piece with a palette of pink, magenta, brown, black and white, part of the Zen Mandala modern art series (surreal landscapes in a contemporary Asian style), is sold but prints are available.